I had a cold when Anthony turned three years old (two weeks ago), which may explain why this picture turned out so blurry. Or, it could be because I was holding the camera with one hand (holding a video camera in the other). Or, it could be that my camera isn't spectacular in low light, and needed a long exposure. In any case, I think that the overall effect is quite nice. Happy Birthday my little stinkpot. 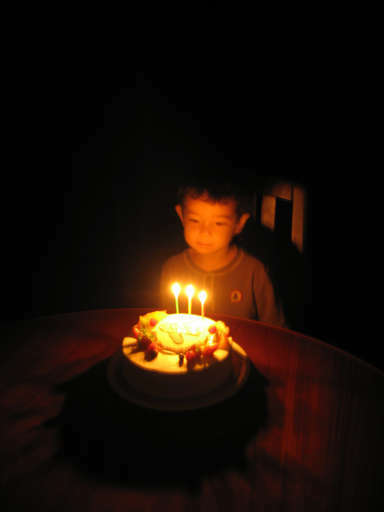 I want to go back to the days when my birthday candles couldn’t light up the whole room sufficiently.